We never run short of opportunities to test our compassion. 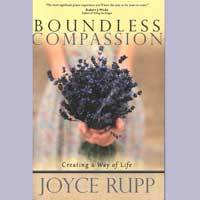 Joyce Rupp developed the Boundless Compassion program when she realized that Christian Gospels repeatedly suggest the use of compassion yet give us no path for getting there. These sessions provide practical and meaningful paths for exploring various aspects of compassion. This human virtue is not wimpy or starry eyed, but essential for healthy living. Each of these sessions explores a different aspect of compassion – with a nudge to grow in awareness of how we think, feel and respond to our suffering as well as to that of others. Registration is $30 for each session and includes materials, facilitation, and snacks. Please Register by March 22. Payment in full is due prior to arrival.